To Cite: Pirnia B, Pirnia K, Teimouri M, Kolahi P. Acupuncture for Back Pain in Colon Cancer: A Case Report, Int J Cancer Manag. 2017 ; 10(12):e15087. doi: 10.5812/ijcm.15087. Introduction: The research evidence supports the effectiveness of acupuncture as an alternative or supplementary therapy for back pain and some of musculoskeletal pains. On the other hand, the use of opioids in the management of cancer pain is common. The effectiveness of acupuncture on the amount of pain and the level of cortisol in opioid-dependent patients has not been addressed so far. Case Presentation: A 54-year-old man with metastatic cancer under chemotherapy and methadone maintenance treatment after 4 weeks of assessment at baseline received an auricular acupuncture treatment for 1 month. Saliva Cortisol Index was evaluated, using Salvi tests and the pain level was evaluated twice a week through a visual analog scale (VAS). Data were analyzed, using multiple baseline method in the form of pattern A-B. Conclusions: Primary outcome showed that cortisol levels decreased significantly during the acupuncture treatment. Secondary outcomes showed that acupuncture was accompanied by a decrease in the back pain. These findings, in addition to confirmation of the effectiveness of acupuncture on psychological and biological indicators, indicate the role of complementary therapies in cancer management and its side effects. Copyright © 2017, Cancer Research Center (CRC), Shahid Beheshti University of Medical Sciences. This is an open-access article distributed under the terms of the Creative Commons Attribution-NonCommercial 4.0 International License (http://creativecommons.org/licenses/by-nc/4.0/) which permits copy and redistribute the material just in noncommercial usages, provided the original work is properly cited. The use of opioids in pain management in patients with cancer is a common phenomenon around the world (1). On the other hand, the experience of high levels of back pain after surgery in colon cancer survivors have been reported (2). Auricular acupuncture (AA) is a specific type of acupuncture described first in 2,500 BC, presently, executed in National association protocol of acupuncture (NADA), and it is an evidence-based approach. 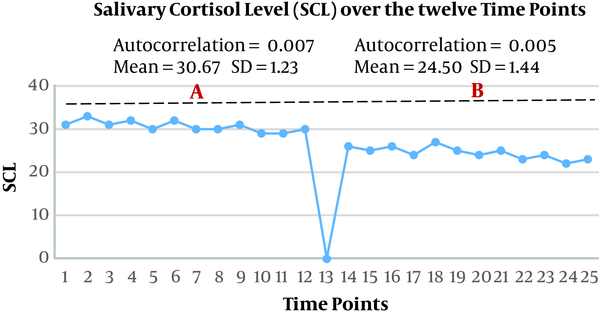 Traditionally, cortisol measurements are used as an indicator to evaluate pain (3). Since a saliva sample is a noninvasive and less troublesome method compared with blood samples, it is used for research purposes. Several studies were conducted on the effectiveness of acupuncture on cortisol level (4, 5). This study is a case report in the form of pattern A-B. The patient was a 54-year-old man with metastatic colon cancer in stage IV under chemotherapy treatment and taking Oxaliplatin with dose of 130 mg/m2 and Epirubicin with the dose of 50 mg/m2. The patient was treated with methadone maintenance for 21 months (Syrup, 8 - 12 cc/per day) and was chosen, using purposive sampling method. Acupuncture was performed 3 times a week for 4 weeks (12 sessions) and each session took 30 to 45 minutes. During the session 5, points of the ear called Sympathetic, Shen Men, kidney, liver, and lungs were intervened. Acupuncture was performed in both ears, using disposable stainless steel needles (0.25 + 13 mm) with a depth of 2 to 3 mm and using manual stimulation by a trained doctor and an acupuncturist (second author, K. P). Cortisol was randomly evaluated 2 days a week, 3 times per day, and the mean of 3 samples was considered a criterion. Cortisol was collected from saliva by Salvi tests. The patient put saliva through a small straw into labeled tubes with the time and date. The patient was taught about eating, brushing teeth, or any drink (except water) in hours prior to the testing session. In order to ensure the lack of influence of sampling from cortisol awakening response, all the laboratory assessment was performed after 11 A.M. (96%, between 11 A. M. and 3 P.M.). The cortisol samples were stored at -20°C or below until the evaluation. The level of cortisol was determined, using an enzyme-linked immunosorbent assay kit (ELISA) that was designed to analyze the saliva. Also, in order to evaluate pain index, visual analog scale (VAS) was used. In this study, the informed consent was obtained and the whole process was carried out based on the latest version of the declaration of Helsinki. Standard deviation and autocorrelation were provided in the form of visual line graphs, and they were assessed, using protocol design model of case study individually with multiple baseline. A-B design is used to assess behavioral and psychological interventions and the purpose of this statistical design is to compare 2 treatments over time or to compare a treatment with control conditions in single subjects (6). Primary outcome showed that 4 weeks of acupuncture was associated with decreased salivary cortisol (Figure 1). The findings of this study are consistent with the results of a study conducted by Wei et al., (4) stating that the use of acupuncture through promoting adrenocorticotropic hormone and the secretion of plasma cortisol led to the regulation of hypothalamic-pituitary-adrenal (HPA) axis activity in the mice with asthma. Also, Guo et al. (5) showed that acupuncture has a significant effect on the level of morning salivary cortisol. The secondary outcome of this study showed that acupuncture reduced the pain symptoms of back pain in the studied patients. Consistent with the findings of the present study, the results of a study carried out by Hsieh et al. (7) showed that laser acupuncture had a significant effectiveness on reducing neurological symptoms in patients under Oxaliplatin treatment induced by peripheral neuropathy. The study performed by Zhou et al. (8) demonstrated that the use of acupuncture is associated with enhancing the quality of life and reducing gastrointestinal symptoms in patients with advanced gastric cancer. Acupuncture, as an assure technique, can adjust the levels of cortisol and can reduce pain in patients with colon cancer. 1. Olarte JM. Breakthrough cancer pain and rational drug use. Support Care Cancer. 2017;25(Suppl 1):11-7. doi: 10.1007/s00520-017-3636-5. [PubMed: 28213817]. 2. Cantarero Villanueva I, Cuesta Vargas AI, Lozano Lozano M, Fernandez Lao C, Fernandez Perez A, Galiano Castillo N. Changes in pain and muscle architecture in colon cancer survivors after a lumbopelvic exercise program, a secondary analysis of a randomized controlled trial. Pain Med. 2017;18(7):1366-76. doi: 10.1093/pm/pnx026. [PubMed: 28340204]. 3. Srithunyarat T, Hagman R, Hoglund OV, Stridsberg M, Olsson U, Hanson J, et al. Catestatin, vasostatin, cortisol, and pain assessments in dogs suffering from traumatic bone fractures. BMC Res Notes. 2017;10(1):129. doi: 10.1186/s13104-017-2450-y. [PubMed: 28327184]. 4. Wei Y, Dong M, Zhong L, Liu J, Luo Q, Lv Y, et al. Regulation of hypothalamic pituitary adrenal axis activity and immunologic function contributed to the anti inflammatory effect of acupuncture in the OVA induced murine asthma model. Neurosci Lett. 2017;636:177-83. doi: 10.1016/j.neulet.2016.11.001. 5. Guo J, Huang W, Tang C, Wang GL, Zhang F, Wang LP. Effect of acupuncture on sleep quality and hyperarousal state in patients with primary insomnia, study protocol for a randomised controlled trial. BMJ Open. 2016;6(3):9594. doi: 10.1136/bmjopen-2015-009594. 6. Rochat L, Manolov R, Aboulafia Brakha T, Berner Burkard C, Van der Linden M. Reducing anger outbursts after a severe TBI, a single case study. Neuropsychol Rehabil. 2016:1-24. doi: 10.1080/09602011.2016.1270837. [PubMed: 28007000]. 7. Hsieh YL, Chou LW, Hong SF, Chang FC, Tseng SW, Huang CC, et al. Laser acupuncture attenuates oxaliplatin induced peripheral neuropathy in patients with gastrointestinal cancer, a pilot prospective cohort study. Acupunct Med. 2016;34(5):398-405. doi: 10.1136/acupmed-2016-011112. [PubMed: 27613370]. 8. Zhou J, Fang L, Wu WY, He F, Zhang XL, Zhou X, et al. The effect of acupuncture on chemotherapy associated gastrointestinal symptoms in gastric cancer. Curr Oncol. 2017;24(1):1-5. doi: 10.3747/co.24.3296. [PubMed: 28270726].